Eugene Earl McDonald was born on November 18, 1898, in the town of Wade in Cumberland County, N.C., to Daniel Franklin (Jr.) and Louella Underwood McDonald. By 1900, the McDonald family was living in Cumberland County, where Daniel McDonald was working as a farmer. By 1910, Daniel McDonald was an overseer on a farm in Cumberland County, and the McDonald family now had seven children. Up until his enlisted in the National Guard, Eugene McDonald was also working as a farmer, likely for his father. 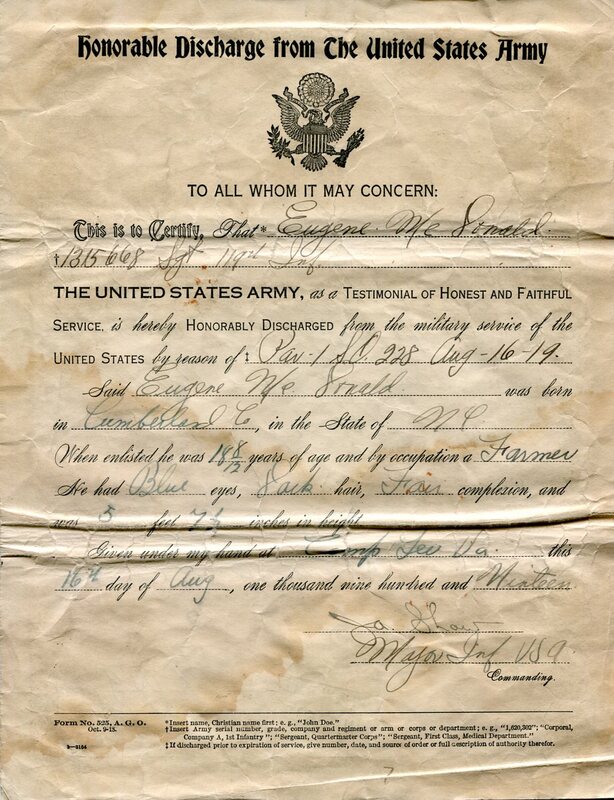 Eugene McDonald appears to have enlisted in the North Carolina National Guard prior the United States’ entrance into World War I in April 1917. He may have served with Company F, 2nd Infantry Regiment, North Carolina National Guard, when the National Guard was called to the Mexican border in 1916, as part of the U.S. Army’s Punitive Expedition against Pancho Villa. Whether or not he was with the National Guard for this action, McDonald was serving in Company F, 2nd Infantry, when it was called into federal military service for WWI. His unit was sent for basic training at Camp Sevier, S.C., on August 9, 1917, where it was federalized as Company F, 119th Infantry Regiment, 30th Division, U.S. Army. While at Camp Sevier, McDonald was promoted to the rank of Corporal on December 19, 1917. He left with the 119th Infantry from Camp Sevier sometime between the end of April 1918 and the first week of May 1918, and arrived at Camp Merritt, New Jersey, on May 8, 1918. As part of the 2nd Battalion of the 119th Infantry, Company F left by train from Camp Merritt on May 10, 1918, for Philadelphia, Pennsylvania. Arriving on May 11th, McDonald and his unit marched from the train for the Philadelphia docks, where they boarded the British steamship SS Laomedon. The ship left the dock at 2 P.M. on May 11, 1918, sailing for England. On May 27, 1918, McDonald’s troop transport ship arrived in Liverpool, England. The men remained on the ship until that evening, when they marched to the railroad and left by train at 10 P.M. for Dover, England. The train arrived in Dover at 8 A.M. on May 28, 1918. By May 29, 1918, the entire 119th Infantry Regiment had been transported across the English Channel to Calais, France. 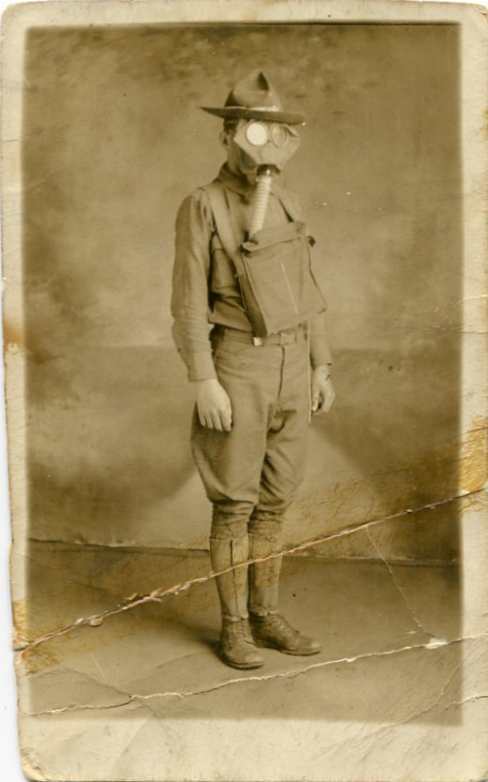 Eugene McDonald served for the remained of 1918 with Company F, 119th Infantry. He was involved in the following military actions in France and Belgium throughout 1918: Ypres, July 26-August 1, 1918; Ypres, August 21-26, 1918; and Bellicourt, France, September 27-29, 1918. McDonald was severely wounded at Bellicourt on September 29, 1918, though it is unknown for sure how he was wounded. After the Armistice, McDonald was transferred to the 291st Company, Military Police Corps, U.S. Army, to serve with the Allied occupation forces in Europe. After being promoted to the rank of Sergeant on July 18, 1918, McDonald left from France in July 1919 for the United States. He arrived back in the U.S. on August 4, 1918, and was sent to Camp Lee, Virginia. Eugene McDonald was honorably discharged from active Army service on August 16, 1919, at Camp Lee, with the rank of Sergeant. By 1920, he had returned home to Cumberland County to live with his parents and siblings, and worked as a farmer (apparently involved in cotton farming). On June 12, 1920, McDonald married Gertrude Lucas in Cumberland County. By World War II, Eugene McDonald was living in the city of Dunn in Harnett County, N.C., where he worked at an automobile sales and service company on North Wilson Avenue in Dunn. Little is known about his life after WWI. Eugene E. McDonald died of an automobile accident on May 15, 1968, in Pinehurst, N.C. He was buried in Mount Hope Cemetery in Southern Pines, N.C.